When I’m not brewing beer, I love hiking around Melbourne, Australia and the world! The Cape Shanck to Boneo Rd Carpark via Bushrangers Bay walk is part of the picturesque Two Bays Trail, which stretches for 26km between Dromana and Cape Shanck. It is the longest continuous trail in the Mornington Peninsula region. Park Victoria grade this walk as moderate. The trail is well marked and easy to follow, with a fairly well maintained narrow dirt track to follow along it's entire length. As this is a first hike post injury, I decided to start gently and I walked a section from the lighthouse to Boneo Rd that was approximately 10km return. The path began from the lighthouse carpark along a wider and more open section of the track. Stunning views of the cape and ocean on the right hand side juxtaposed the busy private paddocks of farms on the left hand side. Soon after the first bend, a lush canopy of trees and ferns formed over the track, providing shade and cover. The sunlight was bright and as it shined through the overhead foliage and illuminated the evaporation from the damp dewy ground, it gave a mystical and magical feel to the place. I had barely walked 1km before a bold large grey kangaroo hopped out of the bush right in front of me on the track. It didn't look like it was going to budge, but as I drew closer it turned and bounded away along the path. I could see the tracks from it's movement all the way along the dirt of the trail until Bushrangers Bay, where it disappeared back into the forest. Kangaroos were not the only wildlife encountered. Several field mice raced across the trail in a flash and I also fleetingly met a black wallaby and a couple of blue tongue lizards. The area is positively teeming with a plethora interesting birds that were heard and seen all the way along the trial. Included in this group was the trail mascot, the delightful fairy-wren. In addition to the wildlife were cows in the green pastures visible in the hills from the higher points of the walk. Some human-animals were also passed running along the track, no doubt in training for the Two Bays Trail run, which is the equivalent of a half marathon distance. The symbol of the Two Bay Trails... the full 26km hike could be a future hike perhaps? The first stop was halfway to the lunch spot at Bushrangers Bay. This involves detouring down some steep steps (remember, in hiking - what goes down must generally go back up!!! 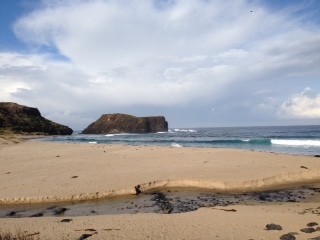 ), but it was well worth the difficult climb back up to see a pristine beach with stunning views in all directions. I have to admit, this being my first hike in a while after an achilles problem, I took a couple of breathers on the climb back up. Carrying extra water was very helpful! Well worth the detour. A 360 degree view shows beaches, ocean, rock formations, green paddocks and rolling hills and the forest behind leading back to the trail. The next section was mostly flat through thick canopy of forest on a very narrow track on the edge of the cliff. I soon arrived at the Boneo Rd picnic area, which was a beautiful open grass area with large trees providing protection from the weather and wooden benches. I also came across an information map that described three walks in the Mornington Peninsula and Flinders areas that are all about 26-30km and connect in a triangle... a future hike perhaps...? There was a crisp chill in the air and my body cooled down rapidly after stopping. Luckily I had many layers of clothing with me and brought something warm to eat. The trusty old trangia was assembled to heat my soup (my father owned the trangia before handing it over to me years ago and it is still working perfectly - worth investing in a good light weight stove!). It was however slightly touch and go. In my haste of leaving for a poorly planned hike, I grabbed an old fuel bottle and found that it was murky and grey! Fortunately it lit and did the job to heat up lunch in several minutes. That wasn't the only close call - my mandarine was completely mouldy when I peeled it. This is a classic example of why you should always take a bit of extra food, water and emergency supplies when you're hiking. Be prepared for anything! Nothing like a warm lunch on a cold day. It really cooled down when I stopped moving so layers and something warm are a good idea. The hike back was significantly quicker... probably as the temperature dropped and a light drizzle of rain started dripping down. In the direction towards Cape Shanck, there is an incline, particularly from Bushrangers Bay and there are a few climbs towards the end that were a bit rough on these tired legs that are not in 100% peak condition post injury! I recommend taking your time if you are a bit rusty, even if it is raining. The fast pace at the start of the return leg was felt towards the end, particularly in my hamstrings with all of the climbs. Made it back to the lighthouse! I got back to the lighthouse in good time and even had time to stroll down to the lookout before stretching and then driving home to beat the peak hour Melbourne traffic. I was lucky enough to see a pair of whales breaching just out from the Cape thanks to a friendly local couple who pointed them out to me. What a thrill to get out in the fresh air of nature again! Getting there: Unfortunately there is no decent public transport to Cape Shanck lighthouse and it would involve several hours of walking, trains, buses and at least one taxi to get there. Best option is by car. A great hike that doesn't take all day. The weather was sublime and the track not too difficult for beginners. The path is clearly marked and quite well maintained. I removed some marks for the loud shooting/explosion type noises coming from somewhere through the bush (From memory I think there may be an army training camp in this area...) and because it was just not quite challenging enough for my liking. Overall a very enjoyable day! Pack: A basic, comfortable day pack with waist and shoulder straps to support the back and shoulders. 1. Check supplies & equipment properly before you leave!! Questions? Comments? Recommendations? Requests for a review of a particular hike/post hike beer? Please feel free to contact me by commenting below!